Good habits tend to come from resisting temptation. However, there comes a time when the lure of shortcuts becomes too enticing and we lose ourselves to bad habits and the comfort of convenience over persistence. We all have our reasons for taking shortcuts, but in the grand scheme of things, shortcuts in selling tend to not be sustainable. Bad practices such as lying about aspects of a product, or being rude and bullying a lead into buying will turn into a bad habit that will eventually harm your abilities to make a legitimate sale. Of course, not all shortcuts hold the same weight. Some shortcuts streamline your day and could help set you up for success. Ultimately, it all comes down to whether you want to save time at the expense of producing quality work, or taking the time and effort to “measure twice, cut once.” Beware of these 4 shortcuts to ensure you don’t dig yourself into a hole of bad habits. It would behoove you to avoid multitasking and researching your prospects while making a sales call. Sure you can try scrolling through their company’s social media page and website but the chances that you’re actually focused and listening to your prospect is slim to none. You’ll miss key details that could help you close the sale and more importantly, you risk sounding insincere and distracted. Give yourself enough time between sales calls to gather important key points, figures, and talking points to help you better prepare for the conversation. You’ll sound more organized and persuasive if the conversation flows well. organized right? Salespeople tend to live-and-die by the plan-of-the-day. They tend to fall into comfortable habits of calling this person at a specific time in the morning or emailing prospects at the same time in the afternoon right after lunch. The problem with this, of course, is that we don’t all run on the same schedule. How do you know if you’re reaching a prospect if you they’re on a different schedule? Perhaps the reason why you’re always leaving voice messages is that they don’t even get into the office until an hour after you make the call every day? Try switching up and varying your call and email times! If you think leaving important details to memory works better than taking the time to grab a pen and writing it down on a piece of paper, than by all means have fun forgetting all the things you should have written down. It might seem more convenient to put our confidence in our ability to remember things, but memories can be vile and more often than not, betray us when we least expect it. The cold hard truth is, you will forget things. So commit to the ten seconds it takes to jot down important details and label them appropriately. Maintaining a to-do list helps you identify all of your tasks and allows you to keep track of your progress throughout your daily routine. You’ll thank yourself later when you turn the page to find what you were looking for. 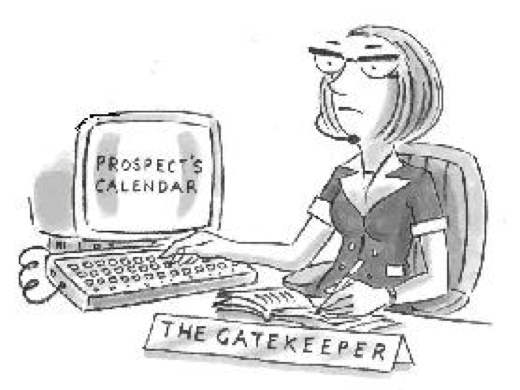 Some salespeople tend to take the Gatekeeper for granted and attempt to duck them at all costs. However, one should be wary when burning that bridge. There is a good reason the Gatekeeper is there to screen calls. Don’t be vague with your intentions around the Gatekeeper. Give them a great reason to put in a good word for you. Treating the gatekeeper with respect can sometimes make it easier for you to connect with the decision maker. There are never any easy shortcuts to success. As with most things worth doing, it never comes easy and often involves getting back up after getting knocked down. Stay passionate about connecting with others and build a solid work ethic by taking the time to do things right the first time around. You’ll save yourself a lot of backpedaling and heartache in the long run. You can avoid developing bad habits and shortcuts by giving it your best every day! Subscribe To Our Newsletter For More Insights And Motivation!